The art of applying mehandi originated in India about 5000 years ago and has been used since then to adorn the hands and feet of women to make them appear more graceful. Since olden times, mehandi was applied on ceremonial occasions to amplify a woman’s beauty and elegance. As time went on, this art spread to various parts of the world and was infused with different styles and techniques. Today we see many versions of the henna application and Arabic mehandi is one such style which has gained massive popularity. 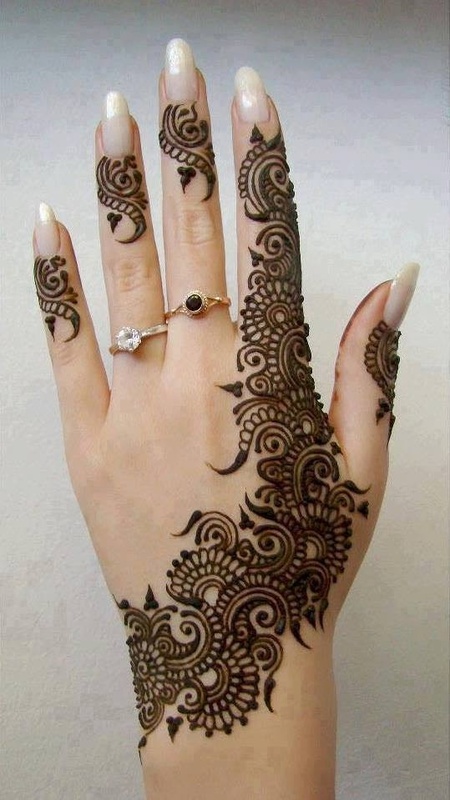 Free flowing: One of the characteristics of Arabic mehandi is that it is very free flowing in its design. It uses elements such as flowers, leaves, vines and dot patterns to create a unified and continuous pattern which is very pleasing to the eye. Unlike the Indian style of applying mehandi which covers the entire palm, the Arabic design flows from the tip of the hand starting at one finger and extends in a flowing manner across the palm. It is not as intricate and detailed as the Indian design, but it is more connected. 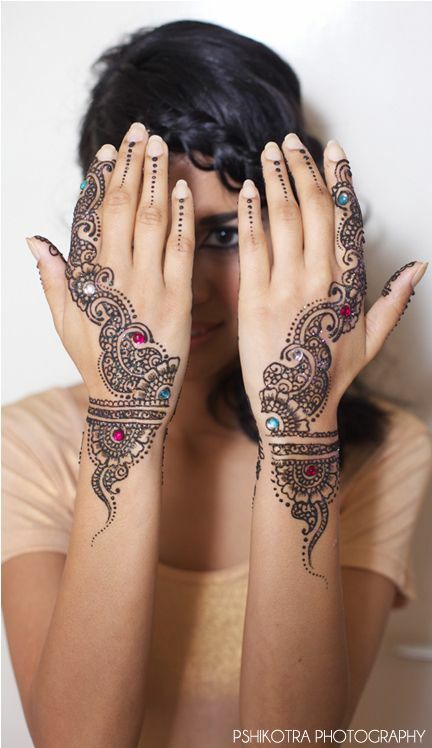 Open and scattered: Arabic mehandi designs are more open and spaced out compared to the close-knit patterns seen in the Indian style. This is also why many Arabic mehandi artists draw with thicker strokes of henna. Since the patterns are not intricate it does not necessarily need fine strokes and appears effortlessly scattered on the hand. Embellishments: While it is not mandatory, Arabic mehandi traditionally uses embellishments and additives of colors in its design. You can opt for sequins and studs or even sparkle and glitter colors to fill up the spaces in the design. This trend is becoming increasingly popular and is used when mehandi is applied for various functions like sangeet and wedding ceremonies. 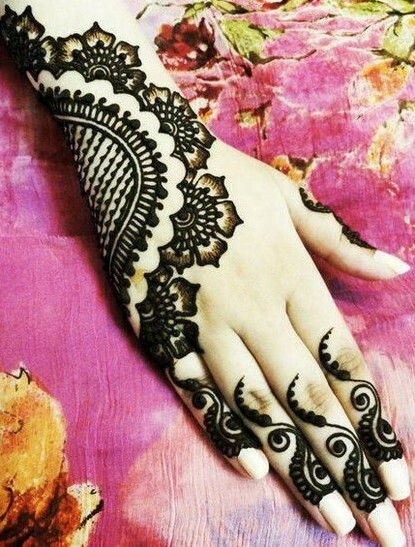 Elegant and easy to apply: Arabic mehandi is very versatile and can be applied on a variety of occasions. It can be more detailed and drawn as a minimalist bridal mehandi, or can even be applied for the love of henna on days when you just feel like it. Its modern patterns and forms make it look stylish and appealing on almost any outfit. And because the designs are so free flowing it can even be easily applied by a beginner. 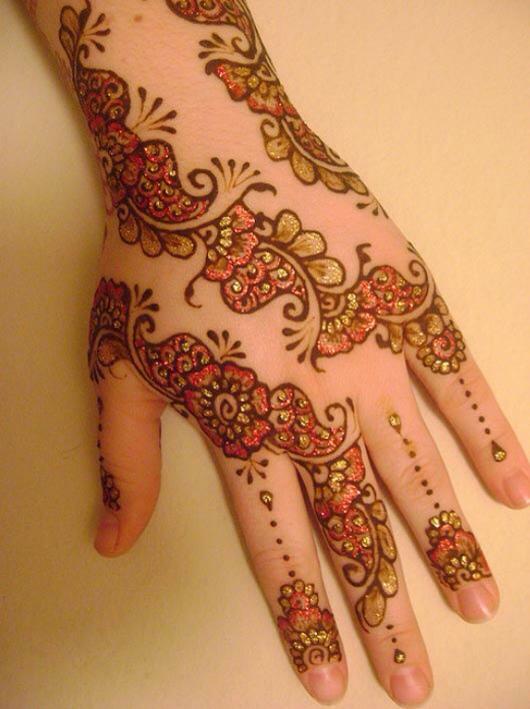 All you need is a cone of henna, a firm hand and some ideas for designs and patterns. And that’s where we come in. You can now take inspiration from these breathtaking Arabic mehandi designs and adorn your hands and feet with some unique styles of your own.